This is a collection of stories and observations beginning with our first time exposing Tsuki to sheep. Keep in mind as you read that my comments should not be taken as the way things are nor as the way they should be It is merely my perspective as novice. They are not particularly exciting stories. Instead they are descriptions of how things can go for someone new to sheep who is training a dog new to sheep. That is my purpose, to offer the perspective of a novice. While I'm lacking in pearls of wisdom, I offer plenty of sympathetic winces, and some hurrahs. I also have a great collection of herding links that will put you on the right track for learning about the different styles of herding, how to find trainers and competitions and more. Uh Oh - they got away! So you think you want to try herding? It is normal for people to have to drive an hour or two for herding lessons. If you don't have access to stock (usually sheep, sometimes ducks or geese) it will be slow going. Can you imagine trying to teach your dog to "heel" without you present? Well that's what it is like to try training your dog to herd without stock to herd. There are a few things you can do without stock but not much. You want your dog to instantly respond to a "stop" or "down". You want your dog to come immediately when you call. While you CAN teach your dog to move to its left or right on your command MOST instructors will not be using that. Movement is generally given relative to the stock. There are four primary moves - around the stock clockwise, around the stock counterclockwise, straight into the stock and get back - that last is usually as a result of a mistake on the part of you or your dog. I have tried to teach one dog directions without the stock. The dog does go in the direction indicated BUT the dog ignored the stock while doing so. Not a good scenario for successful herding. I think that viewing An Introduction To All Breed Herding (video) is a useful way to orient yourself on what you can expect in herding, and some of the basics of what you would be looking for. It may explain a little better by showing WHY you really need the presence of stock to train your dog for herding. When I first started herding I found a couple of books and videos were very helpful in getting me better acquainted with our goals, and how stock move. All the trainers I herd with recommend Holland's Herding Dogs, Progressive Training. I did find the book clear and descriptive. It is hard to put motion into writing, but this author does a pretty good job. The other book frequently recommended is Farmer's Dog. In dog training I have a strong preference for video. Lynn Leach produced An Introduction to All Breed Herding. The followup video All Breed Herding - The Next Steps is really most useful once you have started herding. Before that I think you can't really get the full feel for what is being explained. Why do I herd? The biggest reason I herd is for the big grin on my dogs' faces. 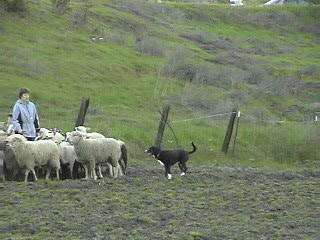 I really didn't expect Freeway to turn into a herding dog, but he just seems to really enjoy himself. And Tsuki - well he's a sheep dog. It is obvious that herding is in his blood. He is never too hot or too tired or too sore to herd one more time. But there is more to it. It is a free flowing activity. There are some organizations that have fairly rigid courses, but the addition of stock adds a huge variable to even the most specific of courses. And most of the herding I do has no well defined course. The course designed for one trial will differ from the course designed for the next. And there is practical work to do as well. Go out to the back field, pick up 50 sheep bring them down through one gate, then through another, split off ten sheep for the upper pen, take the remainder down below, leave 10 behind, put 15 in the round pen and 15 in the front pasture. Watching the different behaviors you get when you change the composition of a flock is interesting, as it seeing how differently the sheep react to different dogs. When I've finished a couple hours of herding my entire being feels refreshed. 10 February 2012: Wait a minute - why are there no more stories? Well ... herding is fun but things change over time. First, I don't "need" to herd because I don't own any livestock. I'm fascinated by herding, and I learned a heck of a lot. However, the places I used to go became unavailable so continuing to practice was an increasing challenge. Tsuki was my compelling reason for herding but age has caught up with him. Gradually I've just let it go. I really miss it, but it will take a different dog or two before it is worth while restoring to my regular bundle of activities. I'm not sure exactly when Charlie (the cat) gets into the middle of the flock it was a surprise to me when the cat walked out of it right up to the camera. With all my stories of Tsuki being on the wild side you just might not recognize him. You don't really need two dogs for only 30 or so sheep, but these two work well together and working well with another dog is a good skill to have.